Product prices and availability are accurate as of 2019-03-31 06:21:25 EDT and are subject to change. Any price and availability information displayed on http://www.amazon.com/ at the time of purchase will apply to the purchase of this product. Width on the watch end: 24mm length: 2.95 inch+4.9 inch. 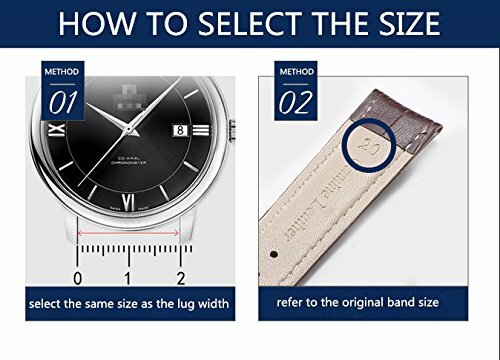 When fastened together, total length is from 5.7 inch to 7.1 inch and plus your watch case length to see if it fits your wrist or not. Please also check the last picture for size guide. We choose the best-quality genuine calf leather to ensure the comfort and long-lasting durability against daily activity and wear and tear. The calfskin lining is also processed with sweat-proof and anti-stink technology. Our leather, just like your skin, can breathe. 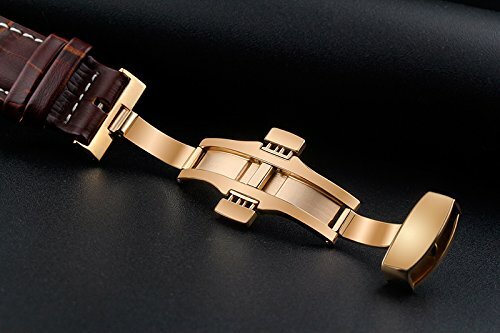 Paired with a polished stainless steel butterfly deployment clasp/buckle with polished double push button mechanism, it can be easily opened by pushing the button without too much strength. It also comes with an installing tool and a pair of spring bars/pins to help you change your bands at the best convenience. It is specially designed and tailored for your swiss luxury watches. This one can be applied to Tissot 1853 watches with straight-end bands, such as prc200, T063, T049, T095, T085, T055, T033, T019, T039, T036, T41, T17. It's also suitable for other branded watches with the same bands, for example, Certina, Swatch, Hamilton, Daniel Wellinton, Calvin Klein, Zenith,Marvin, Invicta, Seiko,Bulvona, etc..